Fundoo Info hosts Industry Thought Leaders, Subject Matter Experts, Entrepreneurs and Academicians on Emerging trends and Industry Insights. Subscribe to this channel to keep yourself updated on latest industry trends. Real-time streaming applications are driving revenue growth in verticals such as retail, IoT, telecommunications, financial services and SaaS. However, architecting the data infrastructure that powers such applications for rapid business value remains a complex challenge. 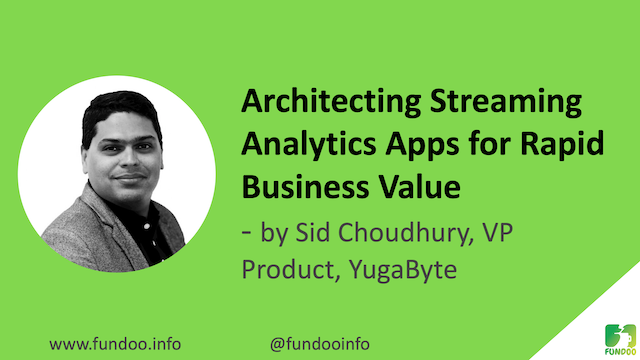 In this talk, we will review the key components of a streaming data pipeline and highlight the desired characteristics from each component in the context of reliability, scalability and performance. A real-world IoT Fleet Management application built on Confluent Kafka as the data ingestion layer, KSQL or Apache Spark as the stream processing layer, YugaByte DB as the operational data store and Spring Boot as the Analytics Dashboard framework will be used to demonstrate how the desired business goals can be achieved with ease. This topic will discuss in the current trend in the FinTech and Financial Services Sector and what are the security challenges and Risk factors and how to prepare yourself to mitigate them. In recent years, diversity has come a long way nationally and internationally. Current data suggests that we still face challenges to engage diversity with inclusion. Per recent reports, the architecture/construction sector still lags and in need to empower women, practice equity and promote diversity. This presentation will review national efforts for D&I - where we were and where we are now. We will try to understand the concept/forms of exclusion and how our efforts both at a personal level and professional level can eliminate it. Eventually, it is not about being a woman or a minority, it is about becoming aware of exclusive behavior and cultivating inclusive thoughts and actions. face and what the industry is doing to empower us. differences and accommodating different stages of lives we all are in. Deep dive into the ways machine learning and AI are becoming mainstream and enhancing analytics solutions and insights. The talk would aim to de-mystify AI and show that it has been mainstream for longer than we think at different levels of sophistication. Defining AI is the first step in understanding it. Understanding the tools and uses helps make it less intimidating. And knowing it is democratized allows anyone to work in AI. We would walk through real world examples of AI used for leisure, everyday work tasks, and move on to more sophisticated industry uses. All examples keeping in mind best practices to control the AI, which can be a fickle thing when left unchecked. Today's consumers are demanding a customer service experience paradigm to keep up with their growing needs. From real-time instant responses to accessibility from a plethora of text and voice platforms, to understanding natural language. Recent advances in natural language understanding and processing (NLU/NLP) and machine learning have enabled automated chatbots to provide a unique experience for businesses and consumers to connect and converse. In this webinar, we will discuss how businesses can leverage the latest in artificial intelligence and deep learning to create conversational chatbot platforms to wow their customers. Girish MuckAI is VP of Business Development & Strategy at Passage AI. He has 20+ years experience bringing state-of-the-art technology solutions to market and held leadership roles at Juniper Networks, Reliance Jio, Entropic Communications, Westell, Arris, SBC Labs and Cascade. Girish holds a B.Tech from IIT Madras, MS and PhD from Boston University and MBA from the Wharton School. Girish is also the CEO of IIT Madras Foundation. The artificial intelligence revolution is being enabled by the rapid increase in data, computing power in the cloud, and hardware accelerators like GPUs and algorithm innovations. However, only < 5% of organizations have adopted or deployed AI in their operations and > 80% are gathering knowledge and prototyping. In this talk, we will address challenges 1 & 2 using RocketML to aid in building production-grade AI applications. These techniques will not only improve data scientists' productivity, but will also reduce total cost of ownership (TCO) compared to market incumbents. The webinar is hosted by Fundoo.info and moderated by IITAGH Board Member. A number of modern, geo-distributed apps are being built in verticals such as retail, finance and SaaS. In an increasingly multi-cloud and hybrid-cloud world, the applications are becoming portable, but the databases are not. Enterprises are seeking to re-platform the data layer for scalability, developer friendliness and cloud-neutrality. The transactional database tier powering these apps has been a high-latency, hard-to-scale, master-slave RDBMS for a long time. Multi-master configurations or the use of a separate NoSQL DB (for multi-region data distribution) are common solutions. However, none of these solutions achieve the desired business outcomes of high customer satisfaction, increased data protection, and regulatory compliance. This talk will dive into how it is necessary to unify the best of SQL and NoSQL into one database in order to deliver the above business outcomes, and how YugaByte is helping democratize the transactional database layer by offering a single non-proprietary database that can span public and private clouds. YugaByte’s value proposition is strong for both CIOs, who can avoid cloud vendor lock-in at the database layer, and for developers, who don’t have to re-architect existing applications because of YugaByte’s built-in native compatibility to popular NoSQL and SQL interfaces. The Webinar is hosted by Fundoo.info along with IITAGH Board Members. Join Radus Software for a 45 minute webinar to discuss scaling agile. Our experts will provide an overview of agile maturity, discuss the tipping points for scaling agile, and highlight the various levels of SAFe to help Organizations determine the best fit for their transition from agile teams to agile programs and/or portfolios. and how Metronome our SAFe ALM the first and only platform built specifically for SAFe from the ground-up, can help you with this journey through scaling your agile environment..
Major research and advisory firms in Information Technology like Gartner and Forrester identify technologies such as Blockchain technology, Artificial Intelligence / Machine Learning, Internet Of Things, Augmented Reality / Virtual Reality, and Cloud computing as game changers for the foreseeable future. From my experience as the Managing Partner of a consulting and advisory firm, I know that data and data analytics play a significant role in ensuring that these technologies directly contribute to the bottom line of companies. A technology for technology’s sake has no relevance unless it provides a sustainable advantage to corporations by increasing revenues, reducing costs, or improving productivity. This webinar will review the key characteristics of the latest trending technologies mentioned above and how data and data analytics plays a critical role.